1st Group to China, October 1944. This picture was taken in the squadrons' rear area at Chengkung after evacuating the Kweilin airfields just prior to their being overrun by Japanese troops. Front Row: Capt. John Carpenter (Engineering), 2ndLt Richard Stutzman, 1Lt John Powell, Capt. Stan Molander (Adjutant), Capt. Carl Eley, 1Lt Don Penning and 1Lt Phil Dickey (Armaments). Back Row: 1Lt Bernard Braude (Asst. Adj. ), Capt. Harold Bahlke (Communications), 1Lt Oscar "Pop" Nislar, Major James Jeffers (Executive Officer), 1Lt Howard Stephenson, 1Lt Frank Bickel, Capt. George Kutsher, Capt. Leon Watkins (Engineering), 1Lt Tom Crittenden (Supply). Chengkung, China, October 1944. Major McComas and his pilots. The airplane is an F-6C photoreconnaissance variant of the P-51C. Notice the camera port for the K-24 oblique camera located on the lower left fuselage. This airplane, ship #600, was assigned to Major McComas and was named "Miss Revenge". Front Row: Capt. John Carpenter, 1Lt Russ Williams, 1Lt Nimrod Long, Capt. Samual Bowen, Major Edward O. McComas, CO, 1Lt Ray Crowell, 2Lt Paul Petris, 2Lt Max Parnell and 1Lt Billy Guy. Back Row: 2Lt Roy Christenson, 1Lt Lynne Decker, 1Lt Hiram Bushong, 1Lt Frank Palmer, 1Lt Maurice Wells, 1Lt Berthold "Bert" Petersen, 1Lt John Egan, 2Lt Harold Tollett, 2Lt Everson "Vitamin" Pearsall, 1Lt Carlton Covey, 2Lt Claude Jackson, 2Lt Fred Lamphier. Front Row: 1stLt Richard Warrington, 2ndLt Claude Jackson, 1stLt LeRoy Price, 2ndLt Elmo Oxley and 1stLt Ray Crowell. Back Row: 1stLt Everson "Vitamin" Pearsall, 2ndLt Ron Phillips, 1stLt Raymond Trudeau, 2ndLt James "Earthquake McGoon" McGovern, 2ndLt John Grover and 1stLt Chester Malarz. 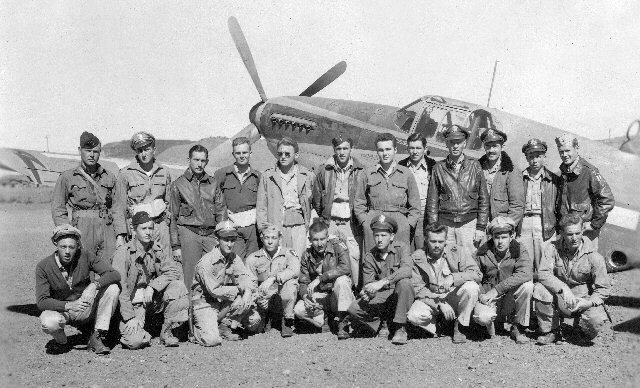 Pilots & P-40, Kweilin, July 1944. L - R: Capt. 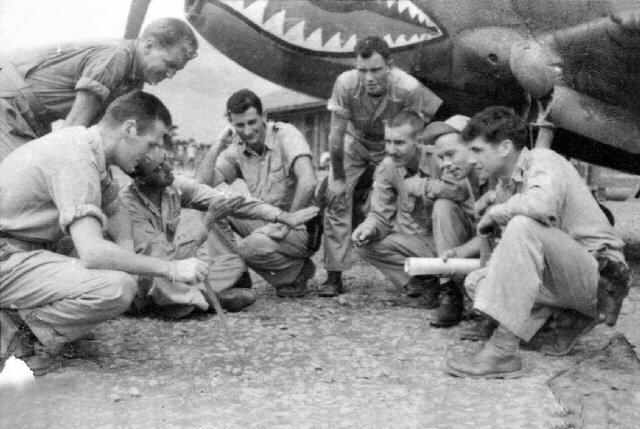 Robert Burke, 1Lt Frank Bickel, 1Lt "Pop" Nislar (talking with his hands), 1Lt Henry "Hank" Davis, Capt. Ray Darby, Major E.O. McComas (CO), 1Lt Jack Smith and 1Lt Oran Watts (first squadron Ace). 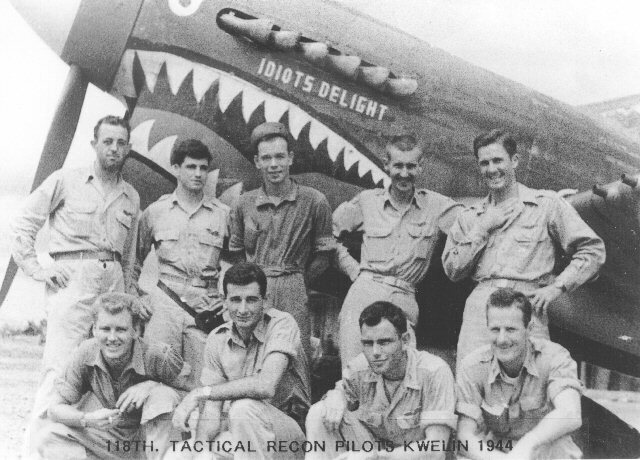 118th TRS pilots at Kweilin, China, July 1944. The shark mouthed P-40, "Idiots Delight", belongs to the 16th Fighter Squadron. 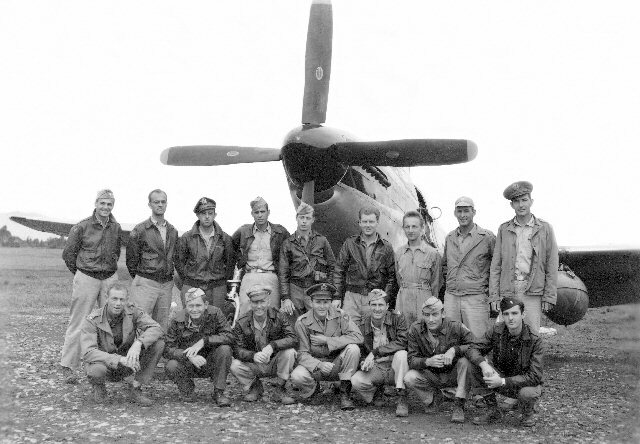 Front Row: 1Lt Frank Bickel, 1stLt Hank Davis, Capt. Ray Darby and Capt. Robert Burke. 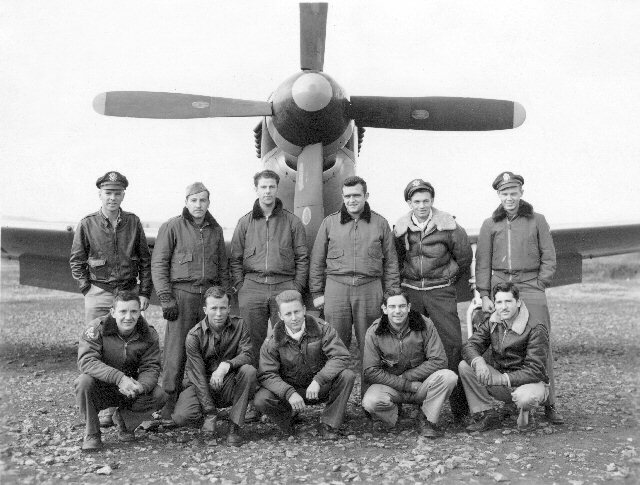 Back Row: 1Lt Oscar "Pop" Nislar, 1Lt Oran Watts, 1Lt Jack Smith, Major Edward O. McComas and Capt. Carl Eley.